Researchers have unearthed what they believe to be a 1,500-year-old church along with a mosaic floor in the ancient city of Stratonicea in southwestern Turkey's Muğla province. 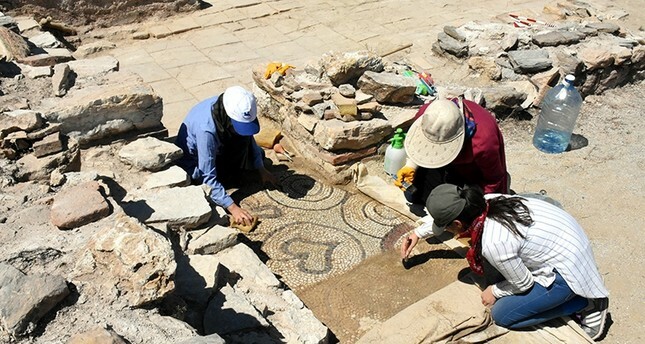 Professor Bilal Söğüt of Pamukkale University, the head of the Stratonicea excavations, told Anadolu Agency (AA) that archeologists were finally able to excavate the church in its entirety and discovered a mosaic floor during the process. Also known as the "City of Gladiators," the ancient city of Stratonicea is on UNESCO's Tentative World Heritage List. The ancient city remained an important hub during the Hellenistic era as well as Roman, Byzantine, Turkic beylik, Ottoman and Republican eras. The church, which has been dubbed as Erikli Church, is special both in terms of archeology and architecture, Söğüt explained. "Erikli Church is one of the places to which people gave most donations during the Early Byzantine period," he said, adding that the team found many relics such as crosses, lanterns and even containers from North Africa. He said some parts of the church, especially the columns, were of high quality both in terms of construction and workmanship. "We will hopefully glimpse how this place looked originally after we are done restoring it," he said. The church was first used around the fourth century B.C. and was completely abandoned in the early seventh century, according to Söğüt. He stated that every year the excavation team uncovers new information about the ancient city. "Stratonicea is a living ancient city. It is a unique settlement. There is no other ancient city where you can see structures belonging to the ancient times and the modern times that are all protected until the present day," he said. Söğüt underlined the fact that Stratonicea, which was once home to the aboriginal Leleges and the Carians, was an important settlement for thousands of years. Researchers were able to fully restore an Ottoman mosque in the ancient city recently. The Şaban Agha Mosque, which was built in 1876, was brought into service last June after restorations were completed.